Using a slow cooker is such an easy way to make meals because you start the meal early in the day and simply forget about it. And that’s the best thing about this recipe — it’s both easy and tastes great. 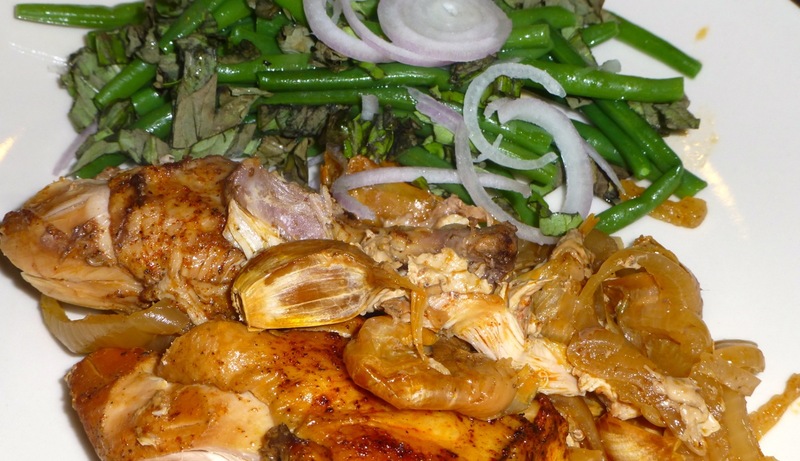 The recipe is called Slow Cooker Twenty Garlic Chicken Dinner and my son served it with a Chilled Green Bean Salad. The salad was not my favorite although I do like green beans. I think the combination of the basil and the onions made the salad too complicated for me. In addition, I don’t think the basil went well with the green beans. So, if you decide to try the green beans and you don’t want onions and basil in it, try other herbs and vegetables until you get the right one for you.